Kathy Sue Traylor is the department secretary in the Communication Design Dept at Kutztown U. She doesn’t think of herself as an artist, but she loves to see creativity in bloom. She often pokes her head in the illustration studio to look over students’ shoulders. She always gushes over the artwork our students are creating. Earlier this month Kathy Sue got to visit Ghent, Belgium. Her husband Bruce, who works for Mack Trucks, was sent to visit a Mack facility there. One evening walking down an alley, Bruce and Kathy Sue saw a young man in a hoodie spraying a graffiti mural on the wall. 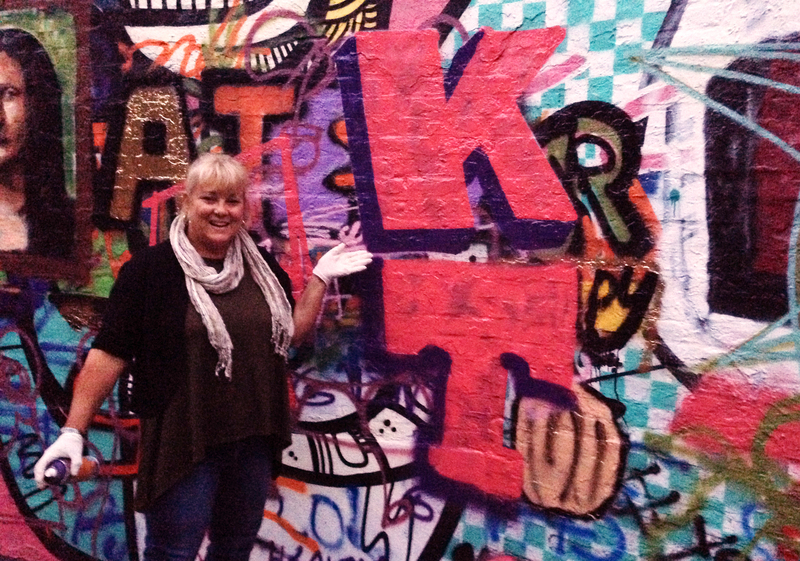 Kathy Sue Traylor tagging the wall in graffiti alley. Not being shy, Kathy Sue asked what was going on. The young man Matthew Dawn was wrapping up a graffiti workshop. He invited Kathy Sue to learn how to tag the wall with her name and initials. Seeing his paint-covered hands, she wasn’t sure this was a good idea. Matthew lent her latex gloves and persuaded her to give it a try. He asked her to write her name in pink to get the hang of the nozzle. Then he set her up to paint her tag a bold red K.T. Kathy Sue tells us this was an experience she will never forget. She pointed out that the graffiti changes every night and by the next day someone had already painted over her initials. She recommends checking this blog for other examples of art on the alley’s walls. 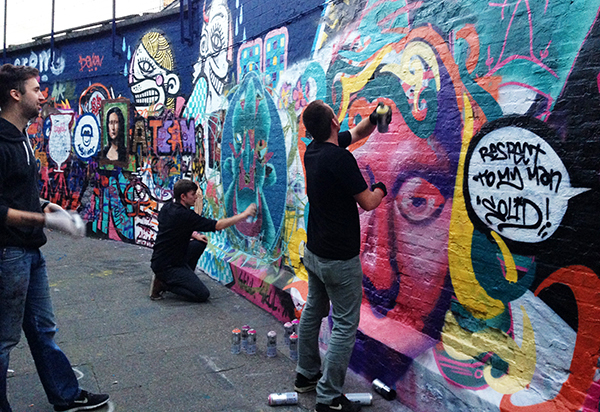 Matthew Dawn, left, and pals in Graffiti Alley, Ghent, Belgium. More of Matthew Dawn’s work can be found at matthewdawn.com. If you visit his site you can view murals at other locations, like the example below. He is not only a fine graffiti artist, Matthew Dawn is a great cultural ambassador for the city of Ghent. Kevin thank you so much for doing this for me. It was an awesome experience and for just a few minutes I felt like an Artist. You are an artist! and you help so many young artists in our program, Thank you!